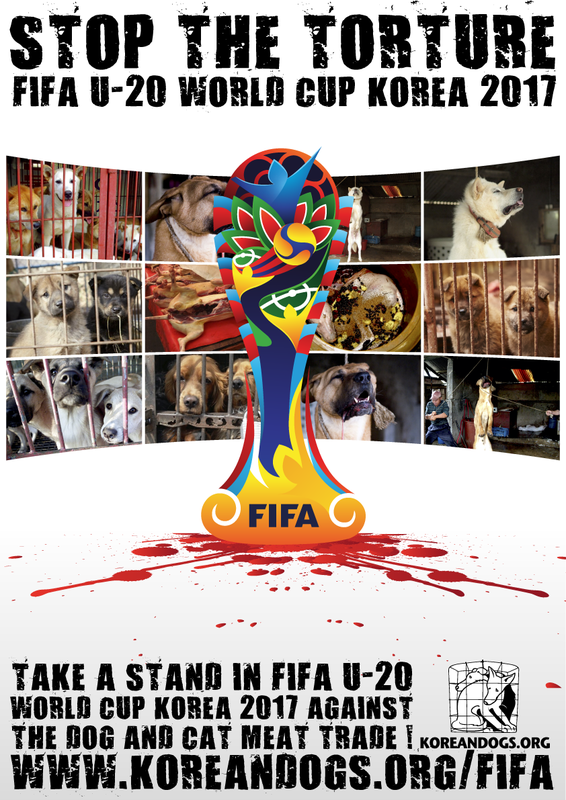 The Fédération Internationale de Football Association (FIFA) : Take a stand in FIFA U-20 World Cup Korea 2017 against the dog and cat meat trade! Home / Blog / The Fédération Internationale de Football Association (FIFA) : Take a stand in FIFA U-20 World Cup Korea 2017 against the dog and cat meat trade! [Update: June 20, 2017] FIFA responded to our petition. Please see below for their response. This is not quite the response we had hoped for from FIFA, but nevertheless, we appreciate that FIFA had responded to us, and had reached out to their Korean counterpart to share our concerns. FIFA would have been more effective if they had openly expressed their indignation and distress with the dog and cat meat trade. Our thank you goes out to all of our supporters who had taken action, especially to Rudy Gallardo who had shared FIFA’s letter with us. FIFA U-20 World Cup Korea 2017 will be held in South Korea in just about a couple of months – May 20 to June 11. The world will be watching South Korea, which is why this is perfect time you take action to support our campaign to end the horrific dog and cat meat trade in South Korea for good! You can help by signing and sharing our petitions, sending out letters and emails raising awareness of this brutal and medieval practice and calling for an end to the trade and taking to social media. South Korea is set to play host to the world in the FIFA U-20 World Cup Korea 2017. 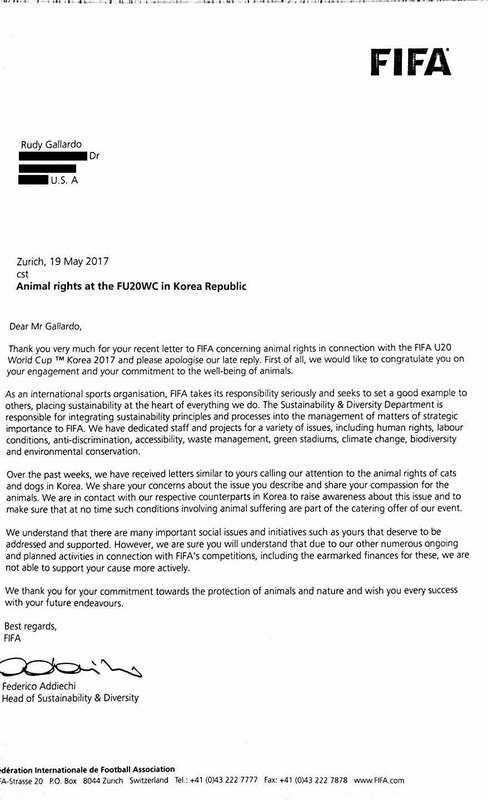 An international gathering of elite athletes, soccer fans, governments and businesses on such a grand scale is a unique platform for taking a meaningful stand against the widely condemned, barbaric and inhumane dog and cat meat trade in South Korea. I also boycott this country … Stop to cruelty ! It is not worthy of a country with such an economic advance, to treat dogs and cats this way! Even in the Middle Ages, the animals were not treated like that !! South Korea must wake up and ban this horrendous trade !!! It will only be the benefit for this country in the eyes of the whole world!! This in this life is totally disgustingly DISPICABLE animals are beautiful souls that deserve our respect not barbaric treatment like this, this is completely unexceptable and MUST END!!!!!!!!!!! Disgusting beyond words!!!!! We should refuse all contact with such a barbaric country till this mass dog and cat killing us stopped!!! Please stop this cruelty !! This horrific and despicable torture and consumption of these poor dogs is an outrage! Please put an end to this immediately! BOYCOTT CRUELTY !!!!! HELP DOGS PLEASE !!!!!! Messages emailed and Tweeted. Hope FIFA take some sort of action. Discusting cruel barbaric horror. I would live to perform these cruel acts on the evil people that do this to poor defensless loving animals. It sickens me to my stomach. This needs to be banned now. I SALUTE AND STAND BESIDE YOU, CINDY~!!!!! WHY AREN’T YOU ADDRESSING THIS ~!!!~???? You are not a third world country who must subsist on any food that is available; you are an advanced civilization and should therefore act as one. One of the hallmarks of civilized society is how you treat animals. Not only is it unnecessary to consume dog and cat meat, but the barbaric practices with which you do so are cruel and inhumane. Stop this practice now. The whole world is watching. Korea, you are an abomination. How do you live with yourselves? Why do you torture animals? What joy do you get from that? You make me sick. I will not buy any of your technology, no Samsung phone for me or my family and friends. Not acceptable at all. Stop such horiffic action! SE REQUIEREN MEDIDAS RADICALES Y TOTALMENTE REPRESIVAS PARA KOREA DEL SUR POR ESTOS CRÍMENES!!! ALTO A LA CRUELDAD Y LA TERRIBLE VIOLENCIA CON ESTOS ANIMALES!!!! Brutal inhuman cruel evil vile country the World is watching yor Demonic acts of pure suffering and torture on these innocent Dogs and Cats . Contact: United Nations Embassy Ambassador Nikki Haley. Tell her to implement and enforce new Animal protection Laws that will stop the dog and cat meat trade world. Pleae implement animal protection laws to hp these voiceless animals. A DISGRACE TO HUMANITY AND TO GOD AND THIS UNIMAGINABLE TORTURE AND SLAUGHTER OF DOGS/CATS MUST BE STOPPED FOR EVER !! From what i know, even Korean national teams eat dog meat before their competition. I can only say thank you to all who protest against these brethren, all who are loud for these dogs, all who sign so many petitions no matter where in the world, all people who do not look away but act -for living the dogs! Boycotting ALL of Korea. Stop this barbaric killing and the myth that men need to eat dogs to gain vitality. Get it from inside you. Stop Corea a queste barbarie !!!! We can’t endorse countries like these that a have no respect for life! Animals are not to be tortured & eating. These barbaric people are sick. There is something very wrong with people who lack any form of compassion. Sick, ignorant, sadistic, evil people!!!! Sick,ignorant,sadistic,evil people. You have summed them up perfectly Sherry.